coffee cart — Cafe in a Box Since 2005 Australia's leading companies have trusted us to serve their delegates. Since 2005 Australia's leading companies have trusted us to serve their delegates. LOVE Cafe in a Box! Michael and his team go over and above to deliver an exceptional service and their range of coffee cart solutions. The baristas not only make exceptional coffee, but are fantastic to work with and have represented our brand perfectly on many occasions now. Can't wait for our next event! A great group of baristas, who worked hard and were extremely flexible, a pleasure to have throughout our 3 day conferencing event. Definitely have their number on speed dial for any future events!! Great coffee, very friendly staff! That's how I would describe Cafe in a Box. I was a first time user, so didn't really know what to expect, but Michael and his team made it all look too easy. Our assigned barista for the day (Ken) arrived on perfectly on time, and setup in record time to deliver great coffee to our event attendees. Nothing for me to do but watch him get setup, serve all day and clean up after himself at the end of the event. Impeccable service! and all that at a very reasonable price. Michael and his team are absolutely brilliant! This is the second time I've used them and I plan to over and over again. We had them in for a short time to surprise and delight our staff and what a delight they were! Efficient, friendly, professional, the list goes on! The coffee is delicious too! Can't wait to work with you guys again! We've been working with Lee, Michael and the Cafe in a box team for the past couple of years. They always deliver at our busy Open Day events at our Ultimo campus. Would highly recommend! Micheal, Ken and the team has been involve in our conference for over 6 years! And our delegates rave about these guys and their coffee. Excellent service and commitment - on time and very prompt communication. Michael and Cafe in a Box were absolutely brilliant! The service was professional, coffee was great and communication was easy. Would highly recommend and I will definitely be booking them for my next event. Michael and the team at Cafeinabox make the best coffees and our delegates would be in riot if they weren't present at each of our conferences! They are always professional, easy to work with and above all have the best baristas and coffee available. -Kerri Kikki-On time, friendly, professional and quality coffee! Delicious coffee, delightful gents: Ken, Ben and Michael delivered. On behalf of The Spark and the teams at Coronation Property Co. and Twentieth Letter, we just wanted to express our thanks and appreciation to yourself and the amazing Ken (a well earned title) for making the Ground Breaking Ceremony of the Paper Mill just that little bit more special. The outcome of the day was an overall fantastic response from everyone. I hope it ran just as smoothy on your end and you got some great pictures of the event out of it. It was great to meet you at Pacific 2015 this week and even greater to enjoy your fabulous coffee. Your professionalism, efficiency and ability to make an amazing brew meant you blended seamlessly into our stand. In fact, forget the submarines, I think you were the star attraction! Please pass on our thanks to your team and best wishes for upcoming events and the continued success of your business. We'll be in touch with events in the future. Just wanted to say a huge thank you for having had the opportunity to have Ken come and visit Wollongong for the morning to help be a part of our morning tea for R U Ok? Day! It was that extra something everyone appreciated and plenty of impressed happy employees who complimented having their coffee served in next to no time! Thank you again and look forward to hiring again in the future, cheers. 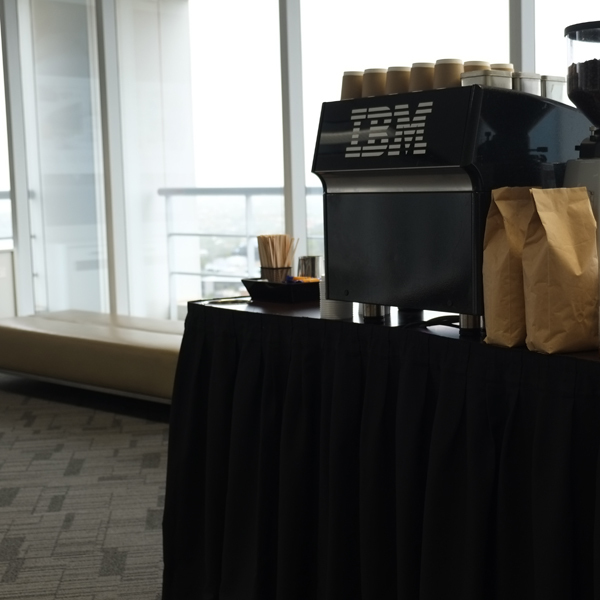 During our project debrief with the client yesterday, IBM could not express enough how pleased they were with your service saying as well as providing exceptional tasting coffee, your personality and the way you engaged with the delegates was fundamental in the success of IBMs participation in FutureGov. Cafe in a Box were a perfect fit for our Fruttare Frozen Fruit Smoothies brand launch, blending up some delicious, fresh strawberry and banana smoothies all morning for our staff! Michael and staff were incredibly professional, easily able to deal with all corporate protocol and always two steps ahead. I wouldn’t hesitate to use the team again. Thank you so much for the support you provided us over the weekend for SHIFT2014. You and your people were truly amazing in the way you treated us and our guests, the service and support and outstanding. I have been involved in arranging many events over my time and participated in even more and have never been looked after as we were by your people. Please extend to your staff and those associated with the event our appreciation and gratitude for making SHIFT2014 an outstanding success and one that will not be forgotten for many years to come. Thank you so much for your assistance in the celebration of Optiver reaching Number #1 in the BRW Great Places to Work Survey! The guys really enjoyed the treat of having some tasty smoothies and juices to start the day. Set up and pack down was seamless and would definitely use you again should we have another event! Just wanted to compliment and praise the terrific job Leanne did at our trade display at this weeks conference. Her service and timing was impeccable at the fresh smoothy bar and it was the little things she did that really added to the wonderful service provided. Other than the smoothies being always fresh, cold and delicious, she really looked after our customers and made sure they were attended to quickly and efficiently. No long queues here! Further what I was particularly impressed by was how she kept our very expensive investment in the trade display clean and inviting. Well done Leanne on a outstanding job and "Cafe In a Box" for providing a brilliant service. our exhibitor booth. Leanne did a stunning job not only making a perfect cup of coffee (remarkably remembering most candidates special preferences . . . . astonishing! ), but also was a vibrant, warm, and friendly personality throughout the three-day event. We had many customers complimenting us on the concept and the wonderful Leanne. Her professionalism reflects directly on our company and we could not have been more impressed. Congratulations to Leanne and your company – an idea we shall definitely consider at future events. I would like to express my thanks and gratitude to you for making the whole experience of hiring a coffee cart extremely enjoyable and seamless. It was an absolute pleasure to have you and Leanne here. Thank you for your professionalism and great coffee. For SMPTE 2009 Sony needed espresso coffee for our ‘Sony Sports Lounge’ that formed part of our large trade display. The starting point for our search was simple, we wanted excellent, consistent specialty coffee and a friendly service for our clients, international guests and staff. Michael and the Cafe in a Box team was recommended to us by another specialty coffee roaster and we couldn't be happier with the product and service provided. On our first meeting with Michael, he showed us around his roasting facility and made a number of coffees for us to try. It was immediately clear that we had found the right business to partner with for the 2009 SMPTE Trade Show and Michael was a great help with sourcing and offering the additional items that we required to complete the coffee service for our ‘Sony Sports Lounge’. The feedback from our clients, and never ending flow of people ordering coffee speaks volumes for how good the coffee is. We have had espresso coffee on our stand before, but nothing as good as what Michael and the team at Cafe in a Box delived. Michael’s passion for coffee flows to the other aspects of his business and results in a great product and service that we would happily book again. Not to be forgotten, we found the pricing to be more than reasonable. Thanks again Michael, you and the team were an integral part of our trade display at SMPTE 2009 and we very much look forward to working with you again. Cafe in a box did an outstanding job for our Biennial Convention. Michael and his staff were on time, professional and friendly. With a full range of coffee’s and a high quality of service I would have no hesitation in using them again. Our delegates loved having a barista at our event that served real great tasting coffee!! Cafe in a Box is the only portable coffee supplier that Infocus Design refers to when it is needed for our clients. In our industry it is important that we maintain a high level of standards and quality at all times, and we can definitely feel confident that Michael will not only represent his company well, but Infocus Design as well. Michael has assisted Infocus Design in many Motorshow’s over the years, and he has helped out with countless shows nation wide, big or small ! There has never been a time when Cafe in a Box has not delivered, and we definitely feel like a top priority at all times. We can always depend on a cost effective quote, and his coffee along with many other hot beverages on offer always tastes fantastic. So thank you Michael for all your great service and incredible coffee, I definitely look forward to working with you in many more events to come. We used the services of Cafe in a Box at a trade stand in Cairns earlier this year when I could not get a local business to supply coffee. Michael Wilcock was most obliging when I contacted him and explained how he operates etc. I was still a bit hesitant as I was not going to be at the event and not having used Cafe in a Box before. It turns out I had nothing to worry about as Michael was a huge success and superseded the expected amount of coffee made over the event which we were happy to honor because it was so good. Michael is very particular about what type and blend of coffee beans he uses and made sure the coffee was fresh and ready to go at every seminar break. We have been so impressed with this service, I have booked him for further events in 2009. Our agency was pitching on some new business and I needed a compact barista to make some coffees and impress the client. Cafe in a Box was too easy. It made a great impression on the client and our staff and we love his coffee. We now have Michael who has come to be known as “our coffee guy”, in every month. I would recommend his service to anyone who loves a good coffee or wants to add something to their function or event and thanks again to Michael for his constant high level of service. We first saw the 'Cafe in a Box' concept on the Mazda stand at the 2007 Sydney Motor Show and were immediately taken aback, by both the level of service that was offered and the quality of the coffee that was being served. After trying the coffee and watching Michael Wilcock and his team in action, we made an 'Executive decision' and decided to commission Michael there and then to provide the coffee for our own rail industry trade show AusRAILPLUS 2007. With hindsight, we believe that it was the right decision. The feedback from the show was very positive and was evidenced by the queues of people who waited for our hospitality area to open every morning across the three days of the show. We also received a lot of personal comments about Michael himself who became a very dedicated and committed member of our own 'Exhibition' team. Comments like 'Best coffee we have ever tasted' became routine, as were the sight of empty coffee areas on other exhibition stands. I cannot speak more highly of the 'Cafe in a Box ' concept or Michael and his team who were consummate professionals. For anybody wanting to make an impact at an exhibition, or any other event for that matter, 'Cafe in a Box' is definitely the way to go.